In this part of the series, we will show you how easy it is to run deployment commands on your EC2 fleet with the help of the AWS CodeDeploy plugin for Eclipse. To make it a little bit fancier, instead of hardcoding httpd as the service name, we instead use a place holder ##HTTPD_SERVICE_NAME##. Later, you will learn how this could help you create a configurable deployment task in Eclipse. Next, inside the same directory, let’s create a simple AppSpec file that specifies our shell script as the command for the ApplicationStart lifecycle event. This AppSpec file asks CodeDeploy to run stop-httpd.sh as the root user during the ApplicationStart phase of the deployment. Since this is the only phase mentioned, it basically tells the service to run this single script as the whole deployment process – that’s all we need! You can find more information about the AppSpec file in the AWS CodeDeploy Developer Guide. Now that we have created our template which consists of all the necessary AppSpec and command script files. The final step is to create a metadata file for it, which is in a specific JSON format understood by the Eclipse plugin. isCustomTemplate – True if it is a custom template created by the user; this tells the plugin to treat templateBasedir as an absolute path. warFileExportLocationWithinDeploymentArchive – Since this deployment task doesn’t actually consume any WAR file, we can specify any value for this attribute. constraints – The constraints that will be used to validate user input; supported constraints are validationRegex (for STRING), minValue and maxValue (for INTEGER). Ok, now we that have everything ready, let’s go back to Eclipse and import the AppSpec template we just created. Then find the location of our template metadata file, and click Import. 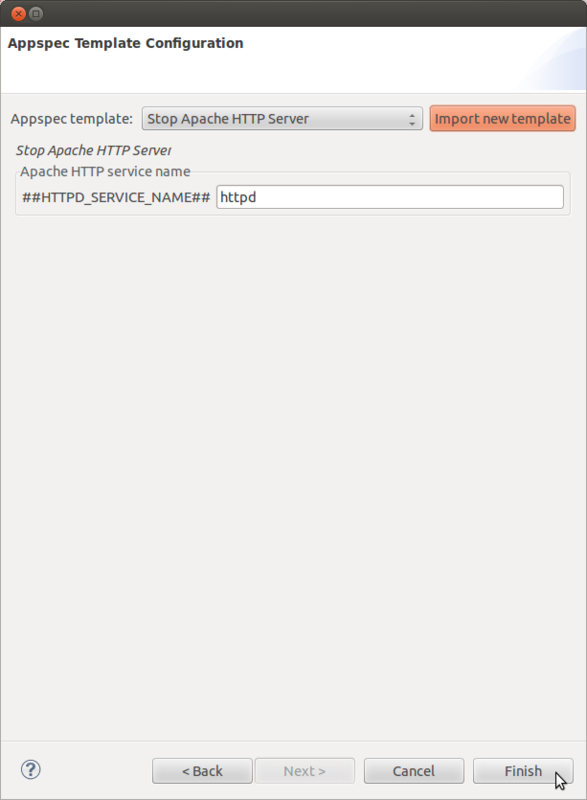 The plugin will parse the metadata and create a simple UI view for the user input of the template parameter ##HTTPD_SERVICE_NAME##. Let’s just use the default value httpd, and click Finish. In the future, if you ever want to repeat this operation on your EC2 instances, just kick off another deployment in Eclipse using the same Stop Apache HTTP Server template, and you are done! You can use the AppSpec template system to create more complicated deployment tasks. For example, you can define your own template that deploys your Java web app to other servlet containers such us Jetty and JBoss. If you are interested in the Tomcat 7 running on Linux template we used in the walkthrough, you can find the source code in our GitHub repo. Feel free to customize the source for your specific need, and keep in mind that we are always open to pull-requests if you want to contribute your own templates that might be useful for other Java developers. The AWS CodeDeploy plugin for Eclipse allows you to easily initiate a deployment directly from your source development environment. It eliminates the need to repeat the manual operations of building, packaging and preparing revision. It also allows you to quickly set up an AppSpec template that represents a repeatable and configurable deployment task. Give it a try and see whether it can improve how you deploy your Java web project to your EC2 instances. If you have any feedback or feature requests, tell us about them in the comments. We’d love to hear them!